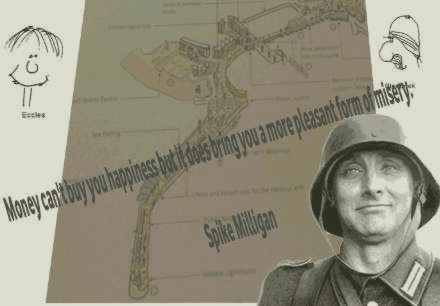 Roger De Haan has the money to bring happiness to Folkestone, or misery! Created with the Child in mind! The report for the Folkestone Harbour Company, included a schools consultation involving around 3,195 children and students, also seemly 273 adults who completed the Folkestone Seafront consultation survey. The report alleged conclusion to the new approach to Folkestone Seafront was that “Some of the younger children (and a few adults) expressed concerns about the proposals to erect homes on the shingle beach”, and that the “younger respondents were also keen to see ice-cream kiosks and sweet shops too!” Seemly the children would like to see the seafront amusements put back. An update presentation on the latest on Roger De Haan’s seafront “Masterplan” idea. 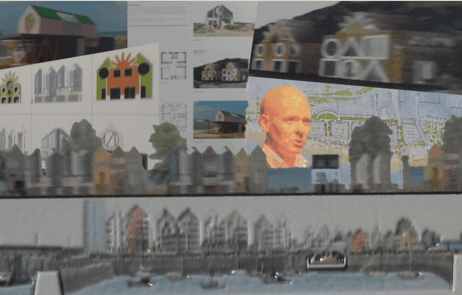 Was reported in the local press on 15th December 2011 of a scheme now of some 1,400 new homes, The presentation was given to 180 visitors on 9th December by the architect Toby Denham and Trevor Minter from the Folkestone Harbour Company. It is alleged that an application for outline planning permission is due to be submitted to Shepway District Council's Planning Department in April 2012. Whether or not, the results of consultation on the proposed new approach to Folkestone Seafront was a useful consultation? The Farrells architects, commissioned by the Roger de Haan came up with a seafront 'pen & ink', with just a hint of Spike Milligan's creative art, showing that they had took on board that which is fascinating to children. Created again with the Child in mind? The above appeared in the Folkestone Herald, newspaper on 27thSeptember 2012. The artists’ impressions, once again seem to have the appearance of having the Child in mind. But they have not drawn in a friend of 'Thomas Tank Engine', on Folkestone's Harbour branch railway line. Sealink Sam's Cross-channel ferries have been replaced by Roger’s 'Jolly Roger' pirate ship! MASTERPLAN Mk.V might popular for those with the child in mind, but about the rest of Folkestone? I must go down to the sea again, to the lonely sea and the sky; I left my shoes and socks there - I wonder if they're dry? 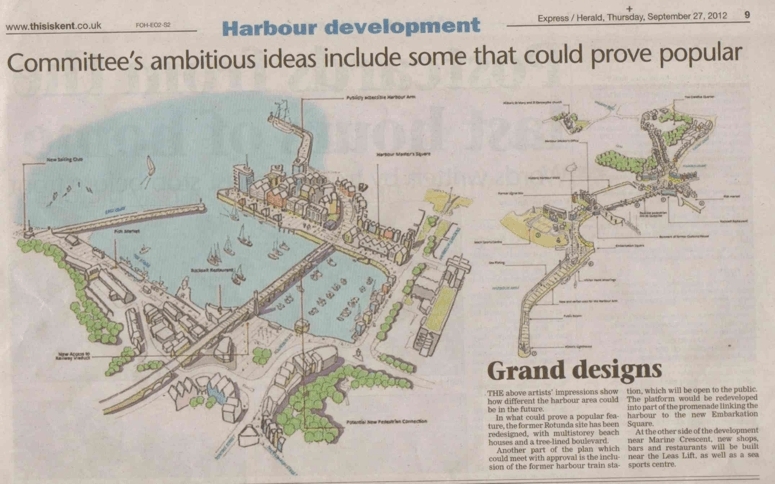 “Development plans for Folkestone Harbour UK include the introduction of two further berths to accommodate larger vessels of up to 7m draft and a harbour dredging programme as well as the ongoing refurbishment of existing berths and the creation of more cargo handling storage space and vehicle standage areas. Port operators hope to have the new berths operational later this year”. Port, Harbour & Marine Constriction: Expansion Plans at Folkestone Harbour: 01 May 2005. Seven years later there is another announcment, this time not for the adult in mind, but for the child in mind. It's all in the mind, you know. - Spike we miss you!